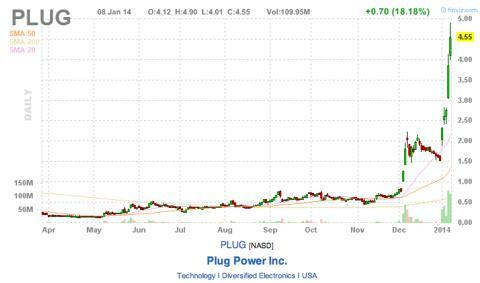 Shares of Plug Power (PLUG) are up more than 100% year to date. That's correct, after the first five trading sessions of 2014, shares of Plug Power have more than doubled after a stellar finish to 2013, surprising all longs, and curb stomping all shorts. Now, a true battle between the bulls and bears is brewing, and a recent bearish Seeking Alpha piece written by Dr. Hugh Akston just goes to show how influential commentary on Plug can be at these volatile price levels. The article may have had an impact on the mild 10% sell off during Wednesday's after hours session, and it evoked a wide spread panic in the online community among investors and traders alike. After the article was released, the raging emotions from both the bulls and the bears permeated like a dead fish left rotting in the sun, which just goes to show how much is at stake here for all shareholders of the company. Plug Power has come a long way (to say the least). 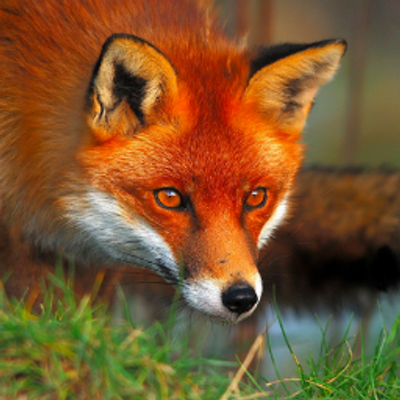 The company was staring down the loaded shotgun barrel of bankruptcy just last year, and just last month, the company was staring down the loaded shotgun barrel of a possible NASDAQ delisting and reverse split. Fast forward to today, and shares of Plug Power have rocketed more than 1000% since possible bankruptcy, and more than 500% since possible delisting, and for good reason. When such a sharp price increase occurs in a security in such a short period of time, many clueless shorts join the party and declare the price action unsustainable and begin bashing the company, solely based off of the companies historical performance, without taking a deep look at the changing fundamentals of the company in question and their future prospects. Plug Power is no different, and the intricate moving pieces behind this company are evolving at such a rapid pace that many investors are having trouble wrapping their mind around the drastic price change. While previous financials of the company paint nothing but a bleak picture of a dying company, recent business updates held by CEO Andy Marsh paint the exact opposite, a "phoenix rising from the ashes," a company that's truly in the midst of being crowned the turnaround story of 2014. While Plug Power's recent run up reminds SA contributor Akston of Usec (USU), a uranium play whose share price soared over the summer on nothing more than pure speculation (increased uranium demand from Japan), and has just recently announced plans to file for bankruptcy, Plug Power reminds me of several promising turnarounds I've been invested in that were once written off for dead by just about every mainstream investor. I'm talking about Nokia (NOK), Sprint (S), Clearwire (CLWR), Alcatel-Lucent (ALU), and even Wendy's (WEN). All of these companies, including Plug Power, have had rocky pasts (albeit some much longer than others), and all of them brought in new management, and with it a new strategy. But what's also strikingly similar between all of these turnaround stocks is that they were all going through inflection points when investors were bashing and shorting the stocks like crazy. "When a change in how some element of one's business is conducted becomes an order of magnitude larger than what that business is accustomed to, then all bets are off. There's wind and then there's a typhoon, there are waves and then there's a tsunami. There are competitive forces and then there are super competitive forces. I'll call such a very large change in one of these six forces a "10X" change, suggesting that the force has become ten times what it was just recently. What such a transition does to a business is profound, and how the business manages this transition determines its future." At this point, saying that the stars have aligned for Plug Power would be an understatement. The inflection point that Plug Power is currently undergoing is a transformational process that will propel Plug Power to the forefront of the alternative energy space. Currently, every single positive fundamental breakthrough that Plug Power had going for itself is now standing right on its front doorstep, and the potential revenue generation from Plug's growing business is just plain outrageous. -Plug Power will reach profitability for the first time in its existence during the second quarter of 2014, an estimate that was just moved up by management (from second half of 2014). 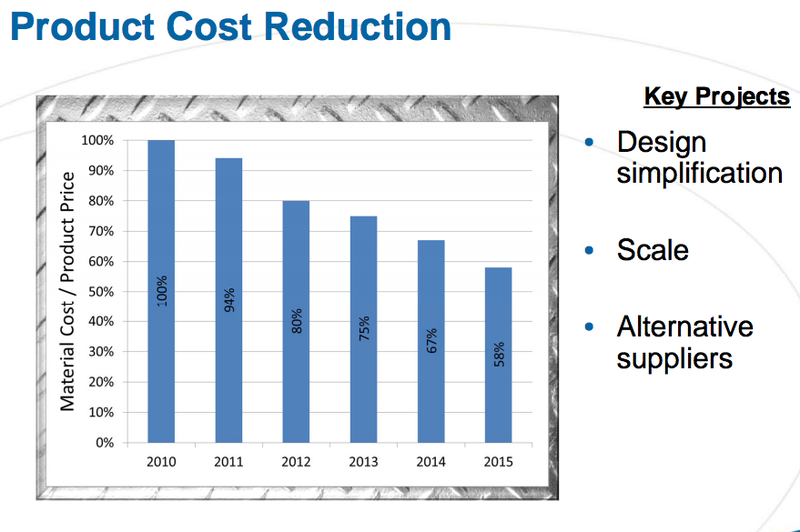 Keep in mind that Plug Power needs to sell 3,000 Gen Drive forklift units to obtain profitability, and expects to obtain 70% of this figure during Q1 of 2014 alone. -Plug Power recently initiated a brand new business division, "the turn-key solution". Plug Power is now in the business of providing and installing the hydrogen infrastructure necessary for a distribution center to operate fuel cell appliances, and will also be constantly supplying customers with hydrogen with a five year service contract. One turn-key deal is expected to generate $8 to $12 million in revenue. This business of recurring revenues will add more predictability to Plug's earnings, and the company has already booked $10 million in sales for this division in 2014 (and growing). --Plug Power is already in the midst of testing a fuel cell based Transportation Refrigeration Unit for Sysco (SYY), who operates a massive fleet of these trucks that carry just about every item you buy from your local grocery store. There are more than 300,000 TRU trucks operating in the US alone, and here's a directory list that points to more than 75 US companies that solely operate these trucks. CEO Andy Marsh commented during Plug's recent business update that he believes the TRU market will quickly surpass Plug's already established material handling market. -Plug Power recently received $3 million in funding from the Department of Energy to develop and test fuel cell range extenders for 20 electric powered FedEx (FDX) delivery trucks. The fuel cell extenders can extend the range of FedEx trucks by more than 100%. The efficiencies and cost savings produced by these range extenders should be very appealing to efficiency freaks UPS and Fedex. 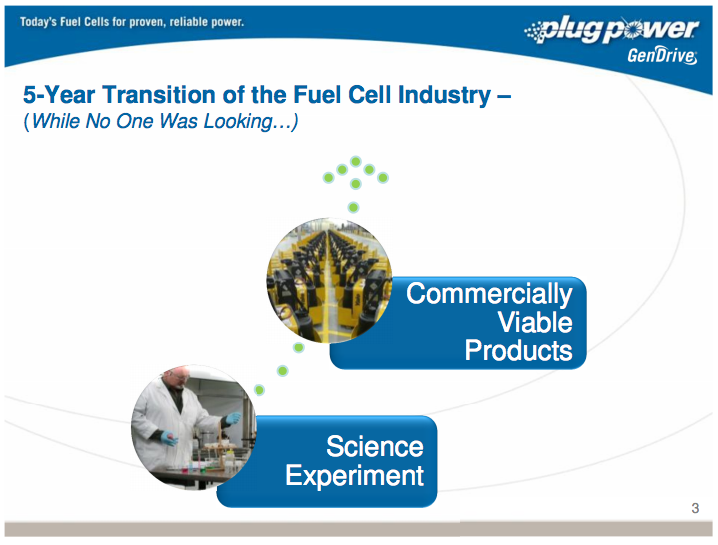 -Plug Power is currently demoing fuel cell prototypes with FedEx for ground support equipment (airport tuggers, auxiliary power units), with a target market of 26,000 units. The company has already received a $2.5 million grant from the DOE for this project. -Plug Power is exploring options to set up a joint venture to establish a footprint in Asia, after receiving countless requests to provide its product to businesses operating in the far east. This would be similar to Plug's joint venture with Air Liquide. The ongoing health concerns stemming from Asia's rampant pollution makes this a perfect time for Plug to enter this expansive market, offering a compelling value proposition. -The Hypulsion JV with Air Liquide is targeting the European market, which is even larger than the US market. More than 6 million forklifts are operating across the globe. -Plug Power recorded $61.8 million in bookings for 2013, with 80% of those bookings being recorded in the last three months of 2013. Explosive growth. 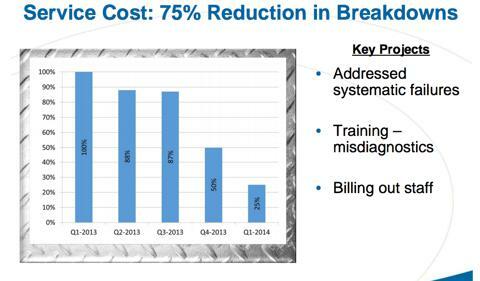 -Plug Power has increased sales, and reduced costs quarter over quarter for the past four quarters. It's difficult to ignore all of these recent positive fundamental developments, and Akston's claim that these recent developments are nothing more than "fiction" is absurd. Currently, a lot of the positive developments listed above regarding new market opportunities will not materialize into revenue for Plug until 2015 or later, with no specific timeline given from management. Focusing solely on Plug's already established forklift business, this company is still a monster. The sale of 3,000 units is needed to generate $70 million in revenue and book a profit for 2014. 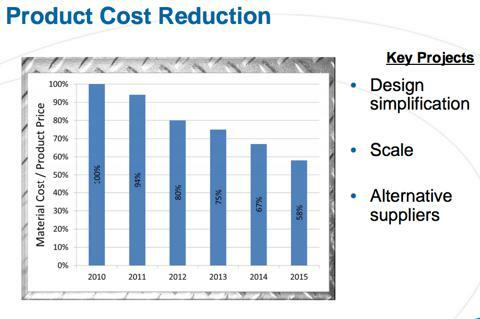 That means each gen drive unit for fork lifts costs consumers approximately $24,000. Plug Power's current US customers operate a combined 250,000 battery acid forklifts, and this number will continue to increase as the company adds customers who operate massive distribution centers, such as Amazon (AMZN) and other fortune 500 companies. Plug's current customer base represents a potential market of $6 billion, and having only sold approximately 4,000 units so far, there is clearly still ample room for growth. Plug catching just 3.5% of its customers forklift base represents $210 million in revenue, or 8,750 gen drive forklift units. 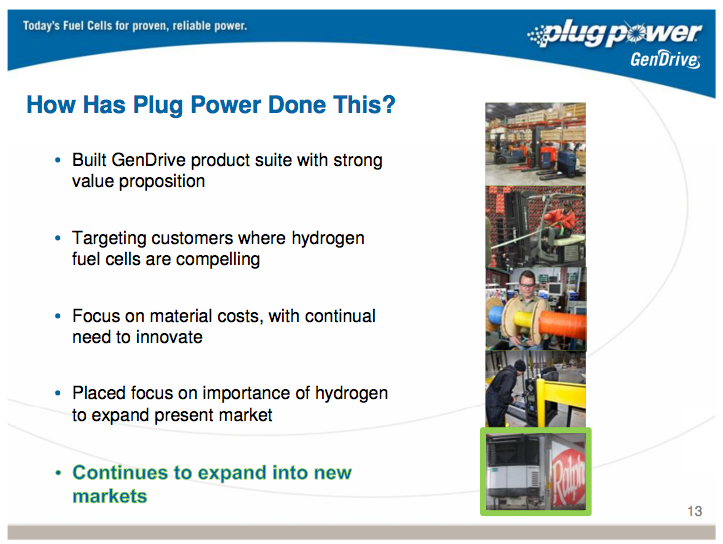 Plug Power's current capacity can handle yearly revenues of $200 million. 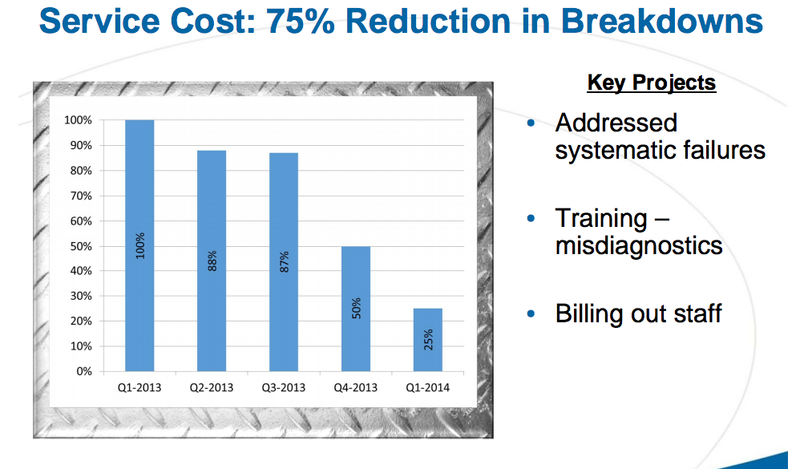 While chances of Plug obtaining 2014 revenues of $200 million are EXTREMELY slim, the fact is Plug is not that far off. The company has surprised investors before, and in a matter of a month, CEO Andy Marsh has released news not once, not twice, but three times that caused the stock to jump upwards of a $1.00. If Plug records $200 million in yearly revenues, a 2X sale multiple would imply a value of approximately $4.00 per share (~ $3.00 per share counting for total warrants outstanding). This estimate is a stretch for 2014, but it is not a stretch for 2015. Keep in mind that this does not account for revenues generated from the already established turn-key division (up to $12 million per site), or any of the soon to be entered markets (TRUs, range extenders, ground support equipment, Asia), or any of the millions of battery acid fork lifts that Plug's Hypulsion JV is already targeting in Europe. It's futile to even attempt to put a value on shares of Plug at this point because the true revenue potential behind this company is far out of the ballpark. Plug Power is short on cash, and the need to raise additional funds soon is a no brainer. While a secondary offering is a big possibility, it isn't Plug Power's only option, and this is evident since most cash strapped companies would issue a secondary offering the second their stock price jumped 100%, let alone 500%. This should give investors the hint that Plug Power is seeking other ways of raising funds without diluting shareholders. Plug Power and its drastically improved business is a new company from just a few months ago, and is barely recognizable. Lenders stopped lending to Plug Power when the company was trading for a few pennies a share, and was truly on the verge of bankruptcy. With a revitalization of Plug's core business, and a drastically improved outlook from just a few months ago, Plug Power should be capable of securing loans from banks, and I believe that's what they're attempting to do right now. A secondary offering and further dilution from Plug Power should not be ruled out by current and prospective investors, but the fact is that this would have already happened by now if Plug was that desperate for additional funds. The company's delay of issuing more shares points to the possibility of securing a new line of credit from a banking institution. Shares of Plug power have been rocketing straight towards the moon since the new year was rung in. Shares of the company took five steps forward and zero steps backward, and that will change very soon. A healthy pullback/correction is in order for Plug Power, but the fair value of approximately $1.00 per share recently highlighted in Akston's bearish Plug article is disconnected from reality, and investors who are looking for an entry at that price level have a better chance of finding a one ended stick. Prospective investors should continue to monitor shares of Plug Power and view any pullback as a long term buying opportunity with multi bagger potential. All information was sourced from the company's previous business update calls. No Comment to " Plug Power: The Definition Of An Inflection Point "